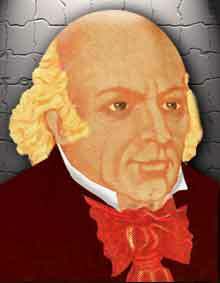 The Homoeopathy was invented by Dr. Samuel Hahnemann (1755 - 1843). He was an allopathic doctor. There is an interesting story behind the invention of the homoeopathic system. It is said that - he failed to cure his child, suffering from typhoid. He began thinking about the failure of his treatment. Once he was reading about cinchona, which was used for curing malaria and to his surprise, he found that cinchona also caused malaria to people without the disease. He took a piece of cinchona bark and studied its effect. When he diluted the cinchona, he found that its therapeutic effect was better. This lead to the development of Homoeopathy and its classical approach. He derived the homoeopathic principle - "Similia similibus Curentur" which translates to "like cures like". In other words, the material capable of causing a disease-like symptom in a healthy person is capable of curing the disease in a sick person. Based on these, the drug known as remedy in this system was developed which is basically extracted from natural resources like plant, animals and minerals.